Find a formula for your dog's unique needs & preferences. What type of dog breed is right for your lifestyle? Find a formula for your cat's unique needs & preferences. Which cat breed matches your personality & lifestyle? Learn about the philosophy that guides everything we do. What goes into a bag of Purina pet food? Bring the whole family out to Purina Farms for animal fun! ST. LOUIS, May 22, 2017 /PRNewswire/ -- Today, Nestlé Purina PetCare Company announced its support for The Nature Conservancy's reThink Soil initiative, a national, collaborative effort to help farmers improve soil health on croplands across the United States, by committing $1 million over five years. Widespread adoption of soil health practices could provide unprecedented economic benefits for U.S. farmers and businesses, as well as significant conservation benefits for generations to come. "Soil is the cornerstone of life," said Larry Clemens, North America Agriculture Program Director for The Nature Conservancy. 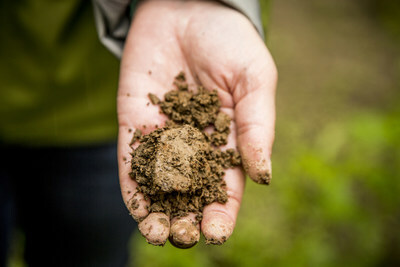 "It's estimated that 95 percent of food comes from soil. Healthy soil practices not only help farmers, but they improve drinking water quality, wildlife habitat, reduce greenhouse gas emissions and build up resilience to extreme weather conditions like drought and flooding. Investing in soil health is an investment in the health and well-being of future generations." Conservancy scientists estimate that less than 10 percent of soils in the United States are managed optimally today. Furthermore, the increasing demand for food, fuel and fiber production by a growing global population is placing unprecedented stress on the health and viability of soil. The Food and Agriculture Organization of the United Nations estimates a 60 percent increase in global food production is required by 2050 to meet the rising demand. "We understand and appreciate that healthy soil is the foundation for healthy agricultural products that nourish people and pets. Soil underlies all of our quality ingredients grown and raised in the U.S., including soy, corn, wheat, rice and meat," said Jack Scott, Head of Sustainability at Nestlé Purina PetCare Company. "We are proud to be a partner in the reThink Soil effort with The Nature Conservancy and its many collaborators." The reThink Soil initiative spans the science, business and policy sectors to advance the widespread adoption of soil health practices — including cover crops, conservation tillage and crop rotation — on at least 50 percent of U.S. croplands by 2025. To accomplish this, the Conservancy is working with the Soil Health Partnership, the largest data-driven, farmer-led soil health research project of its kind, and the Soil Health Institute, a leader in scientific research and advancement of soil health. Together they are working to enact a 10-point strategic roadmap to achieve meaningful soil health outcomes at an unprecedented rate and scale. Strategies include working to improve soil health measurements and standards, increasing support for soil health practice adoption by absentee landowners, expanding the network of on-farm demonstration sites and advancing public policy solutions. Nestlé Purina is the first pet care company to support this initiative, and this commitment will also enable other parts of Nestlé's food business to engage in the work. "With this commitment to our soil health work, Nestlé Purina PetCare Company is continuing its generous support of conservation efforts to help ensure healthy lands and waters while empowering farmers to grow bountiful crops in a sustainable way," Clemens said. Last year, Nestlé Purina PetCare Company's support enabled the Conservancy to build upon decades of work along the Wabash River in Indiana, a critical tributary of the Mississippi River Basin, to reduce nutrient and sediment flow by installing wetlands and woodlands at key junctures (watch a video about the work at Nature.org/Wabash). The company is further supporting the Conservancy's work by investing in reThink Soil to help provide farmers throughout the U.S. with the information, resources and tools needed to advance soil health, and in turn, secure their livelihoods and protect natural resources. "Nestlé Purina and our parent company, Nestlé, are committed to balanced ecosystems that provide cleaner water with less runoff and erosion, as well as increased carbon sequestration and biodiversity," said Diane Herndon, Senior Manager of Sustainability at Nestlé Purina PetCare Company. "We applaud all of the progress that America's farmers have achieved over the years to grow abundant and nutritious crops, and we look forward to working with them and many other partners to continue this progress." Nestlé Purina PetCare promotes responsible pet care, community involvement and the positive bond between people and their pets. A premiere global manufacturer of pet products, Nestlé Purina PetCare is part of Swiss-based Nestlé S.A., a global leader in nutrition, health and wellness. The Nature Conservancy is a global conservation organization dedicated to conserving the lands and waters on which all life depends. Guided by science, we create innovative, on-the-ground solutions to our world's toughest challenges so that nature and people can thrive together. We are tackling climate change, conserving lands, waters and oceans at unprecedented scale, and helping make cities more sustainable. Working in more than 65 countries, we use a collaborative approach that engages local communities, governments, the private sector, and other partners. To learn more, visit www.nature.org/soil or follow @nature_press on Twitter.